WASHINGTON, June 25, 2011 /PRNewswire-USNewswire/ — The World Peace Prize Awarding Council held a grand award ceremony on June 14, 2011 in the Gold Room at the U.S. Capitol to express our respect for the recipients of the 2010 World Peace Prize: H.H. Dorje Chang Buddha III, prominent leader of Buddhism in the world; Hon. Benjamin A. Gilman, former Chairman of the House Foreign Affairs Committee. The ceremony, chaired by Dr. Han Min Su, founder of the World Peace Prize Awarding Council, was graced by the presence of Senator Mark Kirk, member of the Senate Committee on Appropriations; former Senator Steve Symms; Congresswoman Illeana Ros-Lehtinen, Chairman of the House Foreign Affairs Committee of the United States Congress; Congressman Darrell Issa, Chairman of the House Oversight and Government Reform; Congressman Steve Chabot, member of the U.S. House Committee on Judiciary; and Congresswoman Sheila Jackson-Lee, member of the Committee on Homeland Security; Congresswoman Corrine Brown, Chairwoman of the Transportation Subcommittee on Railroads. They all commented on the great achievements of the awardees, who have contributed tremendously to peace and enlightenment for humanity. This event, awarded for the 2010 recognition to those deserving recipients, is part of a continuing program by the World Peace Corps Mission to recognize the outstanding work of individuals who make major contributions for the establishment and maintenance of peace. In view of some recent comments that the World Peace Prize Awarding Council has received from individuals and groups, expressing their misconceptions and misunderstanding. Our Council hereby issues this statement. The co-founder of the World Peace Prize Awarding Council, Dr. Han Min Su, is a Christian leader from South Korea. The foundation of his entire life has been to preach Christianity and morality. He has spared no efforts in advancing world peace and furthering friendship and love among humankind. Wherever he goes, he is well respected within the international community as a minster of high moral character, a kind-hearted leader promoting inter-religious collaboration and world peace. The Chief Judge of the World Peace Prize Awarding Council, Hon. Lester Wolff, is an experienced and distinguished statesman who has worked hard his entire life for world peace. His contributions to peace and development in Asian countries are especially remarkable. He is the author of the United States Congress “Taiwan Relations Act.” In 1978, he met with Deng Xiao-Ping, the Father of Modern China, and laid down the principles and foundation for diplomatic relations between the United States and China. At the same time, he successfully assured peace and development for both sides of the Taiwan Straits. He also introduced amendments to the White House sponsored Foreign Assistance Act of 1979 to restore the initiative for direct peace talks between Israel and the Arab States. Dr. Suzi P. Leggett has been involved with politics and has worked in Congress over a long period of time. She has been the Chief of Staff of a former Speaker of the House. Her husband, the late Hon. Robert Leggett, was the co-founder of the World Peace Corps Mission, a legislator of great fairness, impartiality, and integrity. While in Congress, he served on the House Armed Services Committee and Budget Committee, and was Chairman of the Panama Canal Zone House Merchant Marine and Fishery Committee and co-chairman of the National Security Task Force. H.H. 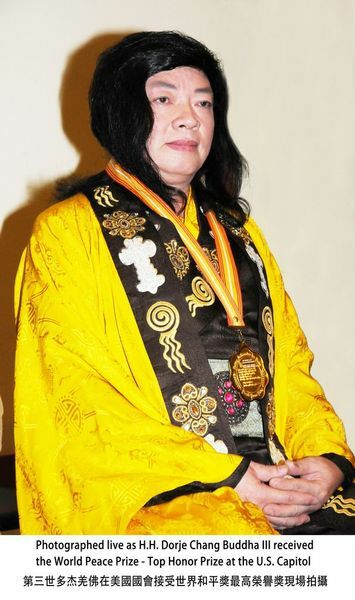 Dorje Chang Buddha III, recipient of the 2010 World Peace Prize Top Honor Prize recipient, was recognized by more than 50 eminent dharma kings, regent dharma kings, and great rinpoches from major Buddhist sects around the world: H.H. Dharma King Dumu Qujie, the Root Master of the 17th Karmapa; H.E. Goshir Gyaltsab, a regent dharma king and national master; H.E. Sharmapa, a regent dharma king; H.H. Dharma King Trulshik, H.H. Taklung Tsetrul, and H.E. Chogye Trichen, all three of whom are Masters of the Dalai Lama; H.H. Dharma King Dodrupchen Thupten Trinle Palzang, H.H. Dharma King Penor, H.H. Dharma King Achuk, H.H. Dharma King Jigme Dorje, amongst others. H.H. Dorje Chang Buddha III is the most widely recognized leader in the history of Buddhism. In the past decade, H.H. Dorje Chang Buddha has suffered greatly for withstanding long-term persecution for his religious activities. A member country of the Interpol has once requested the Interpol to issue a warrant for His arrest. The request was subsequently withdrawn voluntarily by this member country after some years. Upon thorough investigation, in October of 2008, the 72nd session of the Commission for the Control of Interpol’s Files withdrew the arrest warrant and the entire case against H.H. Dorje Chang Buddha III. Interpol also issued a document stating in definite terms that the arrest warrant against H.H. Dorje Chang Buddha III has been cancelled and all of its member countries have been notified of the cancellation. Although H.H. Dorje Chang Buddha III long ago received official notification of the withdrawal of the arrest warrant and the removal of the entire case, He has never shown such documents to prove His innocence. Regardless of the slander He has endured, H.H. Dorje Chang Buddha III did not disclose such ironclad evidence. When the World Peace Prize Awarding Council found out, and asked H.H. Dorje Chang Buddha III about this, He responded by saying that what He must do is bear all of the karmic offenses committed by living beings and give to living beings all of the good karma and merit that He has planted. He said that if He proved His innocence by showing those documents, then those who slandered Him would no longer be seen as innocent. Who, He asked, will bear their karmic offenses? His Holiness Dorje Chang Buddha III is more than deserving of the Top Honor Prize as He exemplifies the nobility of selflessness; a model of morality for all to emulate. He also demonstrated how peace is often attained by determination, humility and the perseverance to advance its cause in the face of adversity. Hon. Benjamin A. Gilman, also recipient of the World Peace Prize Top Honor Prize, is a distinguished statesman who served as Chairman of the House Foreign Affairs Committee for a long period of time. He is a life-long champion of human rights: fighting world hunger, narcotic abuse and trafficking. He has made many successful efforts to bring about “prisoner exchanges” which resulted in freedom of American citizens in East Germany, Mozambique, Cuba and several other countries. Congressman Gilman served 15 terms, a total of 30 years in the U.S. Congress. Prior to that, he served 6 years in the New York State Legislature as Assemblyman, and several years as Assistant Attorney General in the New York State Department of Law. While in Congress, he served as Chairman of the House Foreign Affairs Committee and as Congressional delegate to the United Nations with title of Ambassador, and later the Ukrainian Famine Commission and Vice Chairman of the Committee on POW’s. Mr. Gilman has been a recipient of numerous honors including the President’s Certificate of Outstanding Achievement “for continued, demonstrated vision, initiative, and leadership in the effort to achieve a world without hunger” and has annually received the “Peace Through Strength” Award presented by the American Security Council. The World Peace Prize Awarding Council operates according to the core spirit of advancing peace and justice and inter-religious collaborations. The Council is led by co-founder and executive judge Dr. Han Min Su with esteemed members including Chief Judge Hon. Lester Wolff, former Chairman of the United States Congress Asian Affairs Committee; Dr. Suzi P. Leggett, advisor to one of the former Speaker of the United States Congress; Hon Asher Naim, former Israeli Ambassador to the United Nations; Hon. Bhupatry M. Oza, former Ambassador of India; Hon. Peter Lewis, former Speaker of the South Australian House of Assembly; Dr. Kong Shiu-Loon, former advisor to the UNESCO; General Gennady P. Turmov, retired General of Russia. Preaching and promoting peace is an arduous and sometimes thankless task. Those in the vanguard continue to become targets of others who lurk in the darkness to attack the peacemaker and attempt to undermine their efforts. That is why we established the World Peace Prize, to encourage continuing efforts towards peace and to defend the Peacemaker against scurrilous diatribes that put into question the motivation of well meaning and dedicated individuals. Copyright © 2018 International Buddhism Sangha Association All Rights Reserved. Designed by GreatAsia.